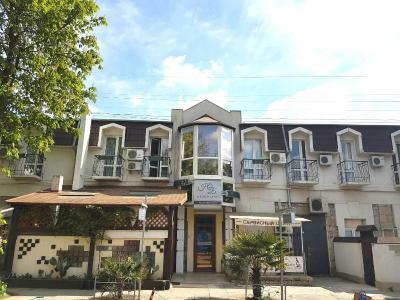 This guest house is located in the center of Alushta, just 1,000 feet from the Black Sea. Free Wi-Fi and a 24-hour reception are featured at Yuzhniy Bereg Guest House. The bright, air-conditioned rooms offer warm-colored interiors and classic-style décor. Each room comes complete with a TV, a refrigerator and a private bathroom, and some rooms have balconies and overlook the sea. A café serving Ukrainian cuisine is 150 feet from the guest house. A food market is 350 feet away. Alushta Bus Station is 0.9 mi from Yuzhniy Bereg Guest House. Simferopol Central Train Station and Simferopol Airport are 31 mi away. When would you like to stay at Yuzhniy Bereg Guest House? Air-conditioned room offers a TV, a refrigerator and a private bathroom. Air-conditioned cottage offers a TV and a private bathroom. This 2-level cottage features a living room and a kitchenette. Features a balcony overlooking the Black Sea. House Rules Yuzhniy Bereg Guest House takes special requests – add in the next step! We need at least 5 reviews before we can calculate a review score. If you book and review your stay, you can help Yuzhniy Bereg Guest House meet this goal.